The purpose of this paper is to present the point of view of the National Association of Sugar Mill Owners of Cuba (Asociación Nacional de Hacendados de Cuba, ANDHAC), for the reconstruction of the sugar industry in a free and democratic Cuba. Members of the Association have written extensively about this matter in conferences and articles. Many civic organizations and individuals have also expressed their ideas on the reconstruction of the Cuban economy, but to complete this task, the individual branches of the industrial sector have to develop their own plan of action. Our plan is based upon the establishment in Cuba of a provisional government during the transition period that will bring about a free election as soon as possible. The Constitution of 1940 that was abolished by the communist regime during its takeover of the island should be enforced immediately. The ANDHAC has to be established in Cuba to hastily work in the reconstruction of the sugar industry so that it can contribute toward an economic recovery that will benefit the country as a whole. The Association would work together with the government through the necessary committees to address the basic problems that will face the industry and the Cuban economy at large. All industrial properties should be returned to their legitimate owners in an orderly manner in the shortest period or time. All functional mills should start operation under their rightful owners, in order to avoid losing any crop, which is badly needed for the economic recovery of the country. There will be another group of mills that will be in need of major repairs; these repairs should be accomplished as soon as possible to put these mills back in operation. A very important matter is to seek the necessary funds to finance the needs of the whole sugar operations (repairs, grinding operation, farming, etc.) from the international banking community (International Monetary Fund, World Bank), and from private banks directly to private industry or through loans guaranteed by the provisional government (government- to-government loans, etc.). A preliminary estimate of the cost has already been made and updated based on information gathered from the island and from international sources. It gives an idea of the magnitude of this problem, but the estimate has to be replaced as soon as possible by an on-site study that should include not only the industrial sector (mills) but also the related industries (e.g., distilleries) and also the farming operations which is primordial for a good crop. 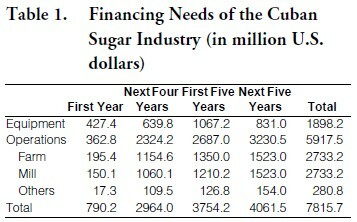 The estimates in Table 1 should not be taken as the amount that the Cuban sugar industry needs to borrow, but as a guideline for the financial help that would be most needed during the first five years. Afterwards, the mills should be able to generate the necessary funds to take care of their operations and repayments of loans; thus the need for financial help will be lower than expressed. This study is for the reconstruction of 157 mills; however, we do not know how many of those that are presently not in operation will be functional. 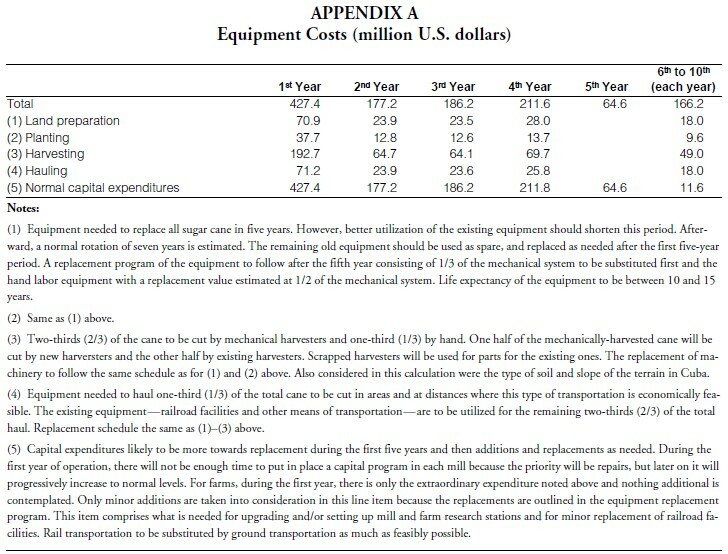 • Equipment is based on U.S cost. • Labor cost is based on those provided in the “Ley de Coordinación Azucarera” (Agricultural Coordination Law). At a price of 12 cents/lb for raw sugar in the world market (contract No. 11), the minimum wage for industrial workers would be $12.88/day and $7.46/day for agricultural workers. The average has been calculated at $18.18/ day ($2.77/hr) and $10.51/day ($1.31/hr), respectively, based on research in some sugar producing where governments set minimum wages but actual wages are always higher. 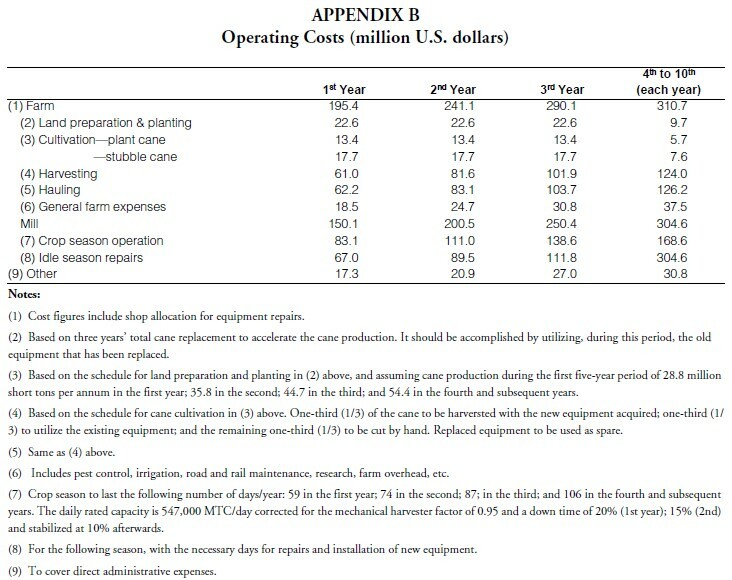 Prices of sugar under contract No.14 for a possible U.S. market has not been taken into account to compute the average labor cost. • Performance is based on U.S. standards, adjusted for deficiencies during the first five years of operation. • Land under cane production for milling: 1.3 million hectares (3.2 million acres). • Additional land for a 7-year rotation: 184,000 hectares (455,000 acres). • Total land under cane cultivation: 1.48 million hectares (3.655 million acres). • Cane production: 38.0 MT/ha. (15.4/acre), with a goal of 76.0 MT/ha (30.8/acre) after the 5th year of operations, freeing up approximately 650,000 ha for other uses. • Estimated lost time: 10% (20% for the 1st year, 15% for the 2nd and thereafter at 10%. • Cane to be ground: 1st year 26.8; 2nd year 35.8; 3rd year 44.7; 4th year and thereafter 54.4 millions of short tons. If all mills could be placed back in their normal operations, they would be capable of producing 7.4 million metric tons of 96% sugar. The reconstruction and revitalization of the sugar industry in Cuba, as shown in this paper, will take time and will not come cheap. But the land, the climate, and most importantly, the people, will contribute to the success of this effort. More detailed information about the capital needs is shown in Annexes A and B. It is a must to consolidate the existing market for 4 million metric tons of sugar and promote additional sales to the U.S. market (return to the pre-communist quota; expand the TRQ; assign to Cuba U.S. consumption increments or amounts to cover diminished U.S. production; same treatment as Mexico under NAFTA; or a combination of these and other options), and to the world market. Taking into consideration local sugar consumption estimated to be in the range of 0.5 million metric tons, there is an initial availability of sugar for export of 4.5 million metric tons that progressively goes up to 6.0 million during the first 5 years of operation. Our estimates take into consideration HFCS, not only for internal consumption but also for the future effect in the world market. We should not depend only on the sugar market, but should also actively pursue the production and sales of by-products like alcohol, paper and board, co-generation of electricity, wax, chemicals from molasses, etc. There are vivid examples of these products in sugar producing areas around the world. The “Ley de Coordinación Azucarera” that was in force prior to the communist takeover, has to be reestablished. This law, among other things, set the bases for the relations between farmers, managers and labor, including salary compensation that varied in accordance with the overall price of the sugar. Programs should be established to improve the working conditions in the industry, which means safety and environmental issues and other incentives. A program should be developed to improve the agricultural sector that will comprise new varieties of cane (experimental stations), proper cultivation (fertilization, etc. ), harvesting and hauling. To mechanize the harvesting economically, the harvesters should be utilized in large and mostly flat areas. This could be accomplished by the sharing of equipment among several farmers. It is estimated that one-half of the existing area will be needed for sugar cane, and two-thirds of this area would be fit for mechanical harvesting. This action plan has to be coordinated with farmers, labor, and the provisional government.